3/19 Skull Creek Marina, 61/41, cloudy, NE20-25>30 - We decided to stay in port today, the wind being what it is. The full moon is Thursday and the creeks are showing it - higher high tides, lower low tides, and a whole lot of current in-between. Compare this to the photo I took yesterday - where are the islands? A layover day allowed us plenty of time to catch up on Walden Rigging business - phone calls, e-mails, estimates. After lunch, Dobbs and I took Murphy on a walk around the community. Alligators could be seen sunning themselves on the banks of almost every pond. I liked the heron at the water’s edge, so the alligator to my right is missing from the photo. At 3:30pm, we borrowed the courtesy car to run a few little errands. One was to pick up a new switch for the light fixture in the head, which after quite possibly 53 years, is failing. I found a pull-cord switch I liked, and Dobbs installed it when we got home. We were treated to a surprise when we returned the car keys and dock hand (and dock neighbor) Fred offered to take us to dinner at Longhorn Steak House. That’s Fred’s Hunter next to Grace, and Dobbs stepping off as we head up to meet Fred for dinner. At 5:15pm, Fred drove us all there (it’s off-island) in his Honda Element. Fred is a musician - a guitarist, bassist, and vocalist - with The Melody Makers. He’s traveled and worked as a musician his whole life; his mother was a night club singer. Along the way, he’s added in other jobs like service manager for BMW, delivery captain for Beneteau, and now dock hand at Skull Creek Marina. 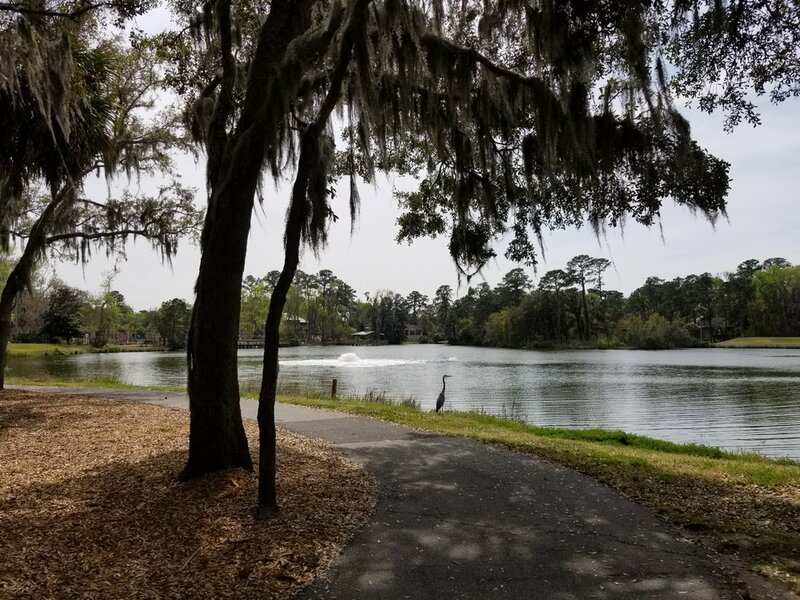 Hilton Head Island has been his home base for many years, and he’s watched it grow from a population of 9,000 to 40,000, with all the changes you might imagine. Fred sold his Hilton Head condo and has been living aboard his Hunter 36 for the last couple years. At dinner, he recommended the filet, which we all had and it was as delicious and perfectly cooked as he suggested it would be. Dobbs and I valued the opportunity to get to know him better. Fred’s an early-riser, so we were home by 8pm, which left us time to do our evening chores before tucking into bed.